Geology is the scientific study of the Earth, the materials of which it is made, the structure of those materials, and the processes acting upon them. The Greek derivation of the word "geology" refers only to the Earth, but since the beginning of the space age, the field has expanded to include the study of the solid matter of other celestial bodies, such as Mars and the Moon. Geological analysis relies mainly on chemistry, physics and mathematics. See the Chemical Glossary. a'a' lava - basaltic lava characterized by a rough or rubbly surface composed of broken lava blocks called clinker. abyssal plain - The ocean floor offshore from the continental margin, usually very flat with a slight slope. accrete - To add terranes (small land masses or pieces of crust) to another, usually larger, land mass. aeolian process - A geological modification, such as sand dunes or erosion, caused by wind activity. Derived from Aeolus, the Greek God of wind. age - A unit of geological time shorter than an epoch, usually lasting several million years. algal mat - A layered communal growth of algae observed in fossils and in present day tidal zones associated with carbonate sedimentation. alkaline - Term pertaining to a highly basic, as opposed to acidic, substance. For example, hydroxide or carbonate of sodium or potassium. allochthonous - Refers to something formed elsewhere than its present location. Antonym of autochthonous. alluvial fan - An alluvial fan is a triangular-shaped deposit of sediment at the point where a river emerges from a mountainous area and flows onto a more gently sloping plain. alluvium - Sediment of sorted or unconsolidated sand, gravel, and clay that has been deposited by flowing water. amber - A fossilized resin from a coniferous tree that sometimes contains entrapped and preserved insects. amphibole - group of generally dark-colored rock-forming inosilicate minerals, composed of double chain SiO4 tetrahedra, linked at the vertices and generally containing ions of iron and/or magnesium in their structures. andesite - Igneous volcanic rock (~60% SiO2), less mafic than basalt, but more mafic than dacite; rough volcanic equivalent of diorite. angle of repose - The steepest slope angle in which particular sediment will lie without cascading down. angstrom - A length of 10-10 meter or one hundred millionth of a centimeter. Its symbol is the Swedish letter Å.
angular unconformity - An unconformity in which the bedding planes of the rocks above and below are not parallel. 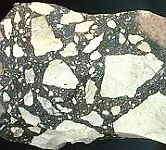 anorthosite - An igneous rock predominantly composed of plagioclase feldspar (90–100%), and a minimal mafic component (0–10%). Anorthosites constitute the light-colored areas of the Moon's surface. anthracite - The most highly metamorphosed form of coal, containing 92 to 98 percent of fixed carbon. It is black, hard, and glassy. anticline - A fold of rock layers with a convex shape pointing upwards. Antonym of syncline. aphanitic - An igneous rock in which the matrix grains are too small to be seen with the unaided eye. Opposite of phaneritic. aquifer - A permeable formation that stores and transmits groundwater in sufficient quantity to supply wells. archipelago - A group of islands; an expanse of water with scattered islands. archean, archaean - An eon of geologic time extending from about 3800 to 2500 million years ago. Derived from the Greek archaios meaning "ancient". The Archean eon is divided into four eras: Eoarchean, Paleoarchean, Mesoarchean, and Neoarchean. arkose - A variety of sandstone containing abundant feldspar and quartz, frequently in angular, poorly sorted grains. arroyo - A steep-sided and flat-bottomed gully in an arid region that is occupied by a stream only intermittently, after rains. artesian well - A well that penetrates an impermeable layer of rock to reach an aquifer containing water under pressure. Thus water in the well rises above the surrounding water table. asphalt - A dark bituminous substance found in natural beds. Residue from petroleum distillation. asthenosphere - The highly viscous, mechanically weak region of the upper mantle of the Earth that lies below the lithosphere at depths between 100 and 200 km below the surface. astrobleme - A circular erosional feature that has been ascribed to the impact of a meteorite or comet. atmosphere (unit) - A unit of pressure equal to 101,325 newtons per square meter, or about 14.7 pounds per square inch. atoll - A continuous or broken circle of coral reef and low coral islands surrounding a central lagoon. autochthonous - Refers to something formed in its present location. Antonym of allochthonous. backwash - The return flow of water down a beach after a wave has broken. banded iron formation - Rock consisting of alternating light and dark layers of iron-rich chert (hematite and limonite) formed approximately 3,800 million years ago. bank - The land alongside or sloping down to a river or lake. bankfull stage - The height of water in a stream that just corresponds to the level of the surrounding floodplain. bar - A unit of pressure equal to 10 to the sixth dynes/square centimeter; approximately one atmosphere. bar (stream) - An accumulation of sediment, usually sandy, which forms at the borders or in the channels of streams or offshore from a beach. barchan - A crescent-shaped sand dune moving across a clean surface with its convex face upwind and its concave slip face downwind. bar-finger sand - An elongated lens of sand deposited during the growth of a distributary in a delta. The bar at the distributary mouth is the growing segment of the bar finger. 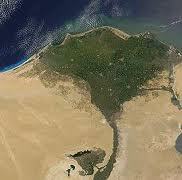 barrier island - A long, narrow island parallel to the shore, composed of sand and built by wave action. basalt - A fine-grained, dark, mafic igneous rock (~50% SiO2) composed largely of plagioclase feldspar and pyroxene; rough volcanic equivalent of gabbro. base level - The level below which a stream cannot erode; usually sea level sometimes locally the level of a lake or resistant formation. basement rock - The oldest rocks recognized in a given area, a complex of metamorphic and igneous rocks that underlies all the sedimentary formations. Usually Precambrian or Paleozoic in age. basic rock - Any igneous rock containing mafic minerals rich in iron and magnesium, but containing no quartz and little sodium rich plagioclase feldspar. basin - A large depression in which sediments are accumulated, or a tectonic circular, syncline-like depression of strata. batholith - A large emplacement of igneous intrusive rock that forms from cooled magma deep in the Earth's crust. 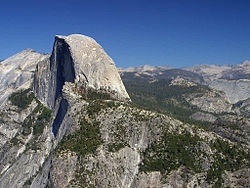 The Half Dome formation in Yosemite National Park is part of the Sierra Nevada batholith. bathymetry - The study and mapping of sea-floor topography. bauxite - A rock composed primarily of hydrous aluminum oxides and formed by weathering in tropical areas with good drainage; a major ore of aluminum. bedding - A characteristic of sedimentary rocks in which parallel planar surfaces separating different grain sizes or compositions indicate successive depositional surfaces that existed at the time of sedimentation. bed-load - The sediment that a stream moves along the bottom of its channel by rolling and bouncing. berg - A mass of floating or stationary ice. Beta-particle - An electron emitted with high energy and velocity from an atomic nucleus undergoing radioactive decay. bedrock - The general term referring to the rock underlying other unconsolidated material, i.e. soil. B-horizon - The intermediate layer in a soil, situated below the A-horizon and consisting of clays and oxides. Also called the zone of accumulation. biochemical precipitate - A sediment, especially of limestone or iron, formed from elements extracted from seawater by living organisms. biostratigraphy - The study of rock layers (e.g., distribution, environment of deposition, age) based on their fossils; biostratigraphic - adj. biotite - A dark-colored phyllosilicate mineral within the mica group, with the approximate chemical formula K(Mg,Fe)3AlSi3O10(F,OH)2.
biostratinomy - The study of what happens between the death of an organism and burial. Part of taphonomy. bioturbation - The disturbance of sediment by organisms, e.g. burrows, trails, or complete mixing. bituminous coal - A soft coal formed by an intermediate degree of metamorphism and containing 15 to 20 percent volatiles. The most common grade of coal. block fault - A structure formed when the crust is divided into blocks of different elevation by a set of normal faults. blowout - A shallow circular or elliptical depression in sand or dry soil formed by wind erosion. A sudden escape of a confined gas or liquid, as from a well. blueschist - Metamorphic rock formed under great pressures, but not so great temperatures. bolson - In arid regions, a basin filled with alluvium and intermittent playa lakes and having no outlet. 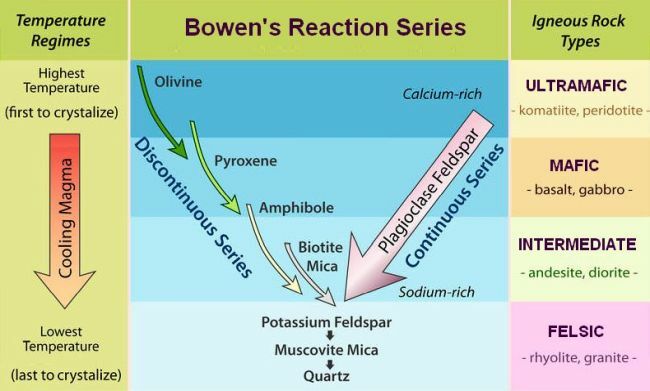 Bowen's Reaction Series - The order of crystallization of common silicate minerals that form at specific temperatures as a magma cools. Named after Canadian experimental petrologist Norman L. Bowen (1887-1956). breccia - Rock composed of broken fragments of minerals cemented together by a fine-grained matrix, that can be either similar to or different from the composition of the fragments. (Compare with conglomerate). butte - A steep sided and flat topped hill formed by erosion of flat laying strata where remnants of a resistant layer protect the softer rocks underneath. calcareous - Term used to describe a structure, secreted by an organism, that consists of or contains calcium carbonate (CaCO3), such as a seashell. calcite A mineral consisting of calcium carbonate (CaCO3) whose crystals have a double image refraction property. caldera - A large, circular depression in a volcanic terrain, typically originating from collapse, explosion or erosion of a volcanic dome. cambrian - The first period (542 to 488.3 mya) of the Paleozoic Era, during which most modern animal phyla developed. The name derives from Medieval Latin Cambria "Wales". carbonate - A mineral composed mainly of carbonate (CO3--) ions with calcium (Ca) and may also include magnesium (Mg), iron (Fe) and other elements. Carbonate also refers to rock or sediments derived from debris of organic materials composed mainly of calcium carbonate such as shells or corals. carbonate platform - A submarine or intertidal shelf whose elevation is maintained by active shallow water carbonate deposition. carbonate rock - A rock composed of carbonate minerals, especially limestone and dolomite. carbonic acid - The weak acid H2CO3 formed by the dissolution of CO2 in water. Carolina Bays - Shallow elliptical depressions with raised rims on unconsolidated ground whose major axis is oriented toward the Great Lakes Region. Carolina Bays have an average width-to-length ratio of approximately 0.58 and occur within 1500 kilometers from the Great Lakes Region. casts - Fossils formed when water containing minerals leaks into a mold. The minerals harden to form a copy of the original structure or organism. cataclysm - a violent geologic change of the Earth's surface. cataclastic rock - A breccia of powdered rock formed by crushing and shearing during tectonic movements. cation - An atom or group of atoms with a positive electric charge. central vent - The largest vent of a volcano, situated at the center of its cone. chalk - A soft compact calcite, CaCO3, with varying amounts of silica, quartz, feldspar, or other mineral impurities, generally gray-white or yellow-white and derived chiefly from fossil seashells. chemical sediment - One that is formed at or near its place of deposition by chemical precipitation, usually from seawater. chemical weathering - The total set of all chemical reactions that act on rock exposed to water and atmosphere and so change its minerals to stable forms. chert - A dense sedimentary rock, composed of interlocking quartz crystals and possibly amorphous silica (opal). The origin of the silica is normally biological, from diatoms, radiolaria or sponge spicules. Synonymous with flint. C-horizon - The lowest layer of soil, consisting of fragments of rock and their chemically weathered products. chronostratigraphy - The establishing of time relations in stratified rocks. The term is generally restricted to deposition-related processes in which the superpositional properties can be used to establish a detailed historical record. cinder cone - A steep, conical hill built up about a volcanic vent and composed of coarse pyroclasts expelled from the vent by escaping gases. cirque - The head of a glacial valley, usually with the form of one half of an inverted cone. The upper edges have the steepest slopes, approaching vertical, and the base may be flat or hollowed out and occupied by a small lake or pond. clast - An individual grain or constituent of a rock; clastic - Describes a rock or sediment composed mainly of fragments of preexisting rocks or minerals that have been transported some distance from their place of origin, e.g., sandstone, shale. clay - Any of a number of hydrous aluminosilicate minerals formed by weathering and hydration of other silicates; also, any mineral fragment smaller than 1/255 mm. -cline - A suffix specifying a form of slope or gradation, such as anticline, monocline or syncline. coal - The metamorphic product of stratified plant remains. It contains more than 50 percent carbon compounds and burns readily. coastal plain - A low plain of little relief adjacent to the ocean and covered with gently dipping sediments. colluvium - Material that accumulates at the foot of a steep slope by rainwash, sheetwash, or slow continuous downslope creep. compactions - Fossils that have undergone some degree of flattening of their three-dimensional structure. composite cone - The volcanic cone of a stratovolcano, composed of both cinders and lava flows. compression - Fossil formed when an organism is flattened (compressed) and a thin film of organic material from its body is left in the rock. concretion - A hard, rounded mass, commonly of silica, calcite, dolomite, iron oxide, pyrite, or gypsum, that formed within a rock from the precipitation of these minerals around a nucleus, such as a leaf, bone, shell, or fossil, and ranging in diameter from centimeters to meters. conglomerate - A coarse-grained sedimentary rock, with rounded clasts larger than 2 mm. Conglomerates consist of rounded fragments and are thus differentiated from breccias, which consist of angular clasts. contact metamorphism - Mineralogical and textural changes and deformation of rock resulting from the heat and pressure of an igneous intrusion in the near vicinity. continental crust - The Earth's crust that includes both the continents and the continental shelves. continental margin - The ocean floor from the shore of continents to the abyssal plain. continental rise - Part of the continental margin; the ocean floor from the continental slope to the abyssal plain. The continental rise generally has a gentle slope and smooth topography. continental shelf - The part of the continental margin from the coastal shore to the continental slope; usually extending to a depth of about 200 meters and with a very slight slope, roughly 0.1 degrees; includes continental and oceanic sediments down to the ocean floor. continental slope - Part of the continental margin; the ocean floor from the continental shelf to the continental rise or oceanic trench. Usually to a depth of about 200 meters. The continental slope typically has a relatively steep grade, from 3 to 6 degrees. contour map - A map showing elevations and surface configuration by means of contour lines through points of equal elevation. copal - Brittle aromatic yellow to red resins of recent or fossil origin, obtained from tropical trees. core - That portion of the interior of the Earth that lies beneath the mantle, and goes all of the way to the center. The Earth's core is very dense, rich in iron and the source of the magnetic field. craton - A part of the Earth's crust that has attained stability and has been little deformed for a long period of time, refers only to continents; cratonic - adj. crossbedding - The arrangement of sedimentary beds tilted at different angles to each other, indicating that the beds were deposited by flowing wind or water coming from different directions. crust - The outermost layer of the Earth, varying in thickness from about 10 kilometers (6 miles) below the oceans, to 65 kilometers (about 40 miles) below the continents; represents less than 1 percent of the Earth's volume. Curie point - Temperature at which certain magnetic materials undergo a sharp change in their magnetic properties. Also called Curie Temperature. cyclosilicate - Mineral with silicate tetrahedra groups linked in 3- or 6-member rings. dacite - Igneous volcanic rock (~65% SiO2), less mafic than andesite, typically fine-grained and light in color. datum plane - An artificially established, well surveyed horizontal plane against which elevations, depths, tides, etc. are measured (for example mean sea-level). daughter element - Also "daughter product". An element that occurs in a rock as end product of the radioactive decay of another element. debris avalanche - A fast downhill mass movement of soil and rock from an unstable slope. declination - At any place on Earth, the angle between the magnetic and rotational poles. decompression melting - Melting that occurs without additional heat when a mineral deep within the Earth at high temperature and pressure migrates to a zone at lower pressure closer to the surface. deflation - The removal of clay and dust from dry soil by strong winds. delta - A delta is an accumulation of sediment deposited where a river empties into a larger body of water. The name derives from the typical triangular shape like the Greek letter delta (Δ). delta kame - A deposit having the form of a steep, flat topped hill, left at the front of a retreating continental glacier. dendrites - Small branching patterns on rocks made of iron and manganese oxides that show the passage of fluids through the rock. dendritic drainage - A stream system that branches irregularly and resembles a branching tree in plan. density - The mass per unit volume of a substance, commonly expressed in grams per cubic centimeter. density current - Any current in either a liquid or a gas that is kept in motion by the force of gravity acting on differences in density, and it stops moving when the two fluids mix. deposition - Any accumulation of sediments by mechanical settling from water or air or by chemical sedimentation or evaporation. deposition remnant magnetization - A weak magnetization created in sedimentary rocks by the rotation of magnetic crystals into line with the ambient field during settling. desert pavement - A residual deposit produced by continued deflation, which removes the fine grains of a soil and leaves a surface covered with closely packed cobbles. detrital sediment - A sediment deposited formed from solid particles of pre-existing rocks or organic debris. diagenesis - The physical and chemical changes undergone by a sediment during lithification and compaction, excluding erosion and metamorphism. diastrophism - The process of deformation by which the major features of the earth's crust, including continents, mountains, ocean beds, folds, and faults, are formed. diatom - A common type of phytoplankton which may be unicellular or exist as colonies. Diatoms usually have siliceous skeletons. diatomite - Diatomite, or diatomaceous earth, is a siliceous sedimentary rock formed from the accumulations of diatoms or other nanoplankton. diatom ooze - A fine muddy sediment consisting of the hard parts of diatoms. diatreme - A volcanic vent filled with breccia by the explosive escape of gases. differentiated planet - One that is chemically zoned because heavy materials have sunk to the center and light materials have accumulated in a crust. diorite - Igneous plutonic rock, less mafic than gabbro, but more mafic than granite and granodiorite; rough plutonic equivalent of andesite. dip - The angle that a bedding plane or fault makes with the horizontal when measured perpendicular to the strike of the bedding plane or fault. divide - A ridge of high ground separating two drainage basins emptied by different streams. dolomite - A carbonate sedimentary rock composed of more than 50 percent of the mineral calcium-magnesium carbonate (CaMg(CO3)2). dome - In structural geology, a round or elliptical upwarp of strata resembling a short anticline. drainage basin - A region of land surrounded by divides and crossed by streams that eventually converge to one river or lake. drift (glacial) - A collective term for all the rock, sand, and clay that is transported and deposited by a glacier either as till or as outwash. drill core - A column of material (e.g., mud, ice, rock) removed from the Earth by drilling. 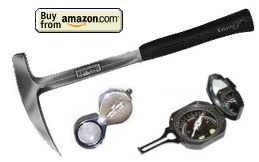 Often used as a tool for exploration of natural resources. 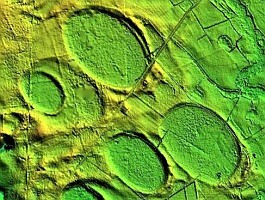 drumlin - Elongated mound of glacial sediment deposited parallel to ice flow. dry wash - An intermittent streambed in an arroyo or canyon that carries water only briefly after a rain. dune - An elongated mound of sand formed by wind or water. earthflow - A detachment of soil and broken rock and its subsequent downslope movement at slow or moderate rates in a stream or tongue-like form. earthquake - The violent oscillatory motion of the ground caused by the passage of seismic waves radiating from a fault along which sudden movement has taken place. ebb tide - The part of the tide cycle during which the water level is falling. echo-sounder - An oceanographic instrument that emits sound pulses into the water and measures its depth by the time elapsed before they return. ecliptic - The plane that contains the Earth's orbit around the Sun. eclogite - An extremely high-pressure metamorphic rock containing garnet and pyroxene. ecology - The science of the life cycles, populations, and interactions of various biological species as controlled by their physical environment, including also the effect of life forms upon the environment. elastic limit - The maximum stress that can be applied to a body without resulting in permanent strain. elastic rebound theory - A theory of fault movement and earthquake generation that holds that faults remain locked while strain energy accumulates in the country rock, and then suddenly slip and release this energy. electron - A negatively charged particle with negligible mass orbiting around the nucleus of an atom. elevation - The vertical height of one point on the Earth above a given datum plane, usually sea level. elliptical orbit - An orbit with the shape of a geometrical ellipse. All orbits are elliptical or hyperbolic, with the Sun occupying one focus. eolian - Pertaining to or deposited by wind. epicenter - The point on the Earth's surface directly above the focus of an Earthquake. epeirogeny - Uplift or depression of the Earth's crust, affecting large areas of land or ocean bottom. epoch - A division of geologic time lasting tens of millions of years. Epochs are subdivisions of geologic periods, often chosen to correspond to a stratigraphic series. Also used for a division of time corresponding to a paleomagnetic interval. era - A division of geologic time of several hundred million years in duration. An era is smaller than an eon and longer than a period. The commonly recognized eras of the Phanerozoic Eon are the Paleozoic, Mesozoic, and Cenozoic. erosion - The processes by which soil and rock are worn away, loosened, or dissolved and moved downhill or downwind. erratic - A large, isolated boulder left behind by a glacier. escarpment - A steep or vertical cliff, either above or below sea level. esker - A ridge of glacial sediment deposited by a stream flowing in and under a melting glacier. estuary - An area where fresh water comes into contact with seawater, usually in a partly enclosed coastal body of water; a mix of fresh and salt water where the current of a stream meets the tides; estuarine– adj. eugeosyncline - The seaward part of a geosyncline; characterized by clastic sediments and volcanism. eustatic change - Sea level changes that affect the whole Earth. eutrophication - A superabundance of algal life in a body of water; caused by an unusual influx of nitrate, phosphate, or other nutrients. evaporite - A chemical sedimentary rock consisting of minerals precipitated by evaporating waters, especially salt and gypsum. exfoliation - A physical weathering process in which sheets of rock are fractured and detached from an outcrop. exobiology - The study of life outside the Earth. extinction angle - The angle between a crystallographic direction, such as a face or cleavage plane, and the direction in which all light is blocked by a pair of crossed polarizers. extrusive - Rocks that form on the surface from molten lava. Antonym of intrusive. facies - The set of all characteristics of a sedimentary rock that indicates its particular environment of deposition and which distinguish it from other facies in the same rock. fault - A planar or gently curved fracture in the Earth's crust across which there has been relative displacement. A fracture, or large crack, in the Earth's crust where one side moves up/down/sideways relative to the other. fault block - Pieces of crust that have slipped into or alongside a fault. fault plane - The plane that best approximates the fracture surface of a fault. fault zone - An area with multiple faults. faunal succession - The evolutionary sequence of life forms, especially as recorded by the fossil remains in a stratigraphic sequence. fayalite - The iron-rich end-member of the olivine solid-solution series (Fe2SiO4). Feldspars have two cleavage planes that intersect at 90°. feldspar - Aluminum silicate minerals that make up as much as 60% of the Earth's crust. Two main types of feldspar are alkali feldspars that incorporate sodium (NaAlSi3O8) and potassium (KAlSi3O8), and plagioclase feldspars that generally incorporate calcium (CaAl2Si2O8). felsic - A term used to describe light-colored igneous rocks with low magnesium and iron content and which are enriched by lighter elements such as silicon, oxygen, aluminium, sodium, and potassium. Felsic rocks have a specific gravity less than 3 and a high content of minerals such as quartz, orthoclase and pagioclase. The most common felsic rock is granite. The term "felsic" derives from the words "feldspar" and "silica" Complement of mafic. fiord - A former glacial valley with steep walls and a U-shaped profile now occupied by the sea. fissure - An extensive crack, break, or fracture in the rocks. fissure vein - A cleft or crack in the rock material of the Earth's crust, filled with mineral matter different from the walls and precipitated therein from aqueous solution. flood basalt - A plateau basalt extending many kilometers in flat, layered flows originating in fissure eruptions. flood plain - A level plain of stratified alluvium on either side of a stream; submerged during floods and built up silt and sand carried out of the main channel. flood tide - The part of the tide cycle during which the water is rising or leveling off at high water. flow cleavage - In a metamorphic rock, the parallel arrangement of all planar or linear crystals as a result of rock flowage during metamorphism. fluid inclusion - A small body of fluid that is entrapped in a crystal and has the same composition as the fluid from which the crystal formed. flume - A laboratory model of stream flow and sedimentation consisting of a rectangular channel filled with sediment and running water. focus - The initial point within the Earth that ruptures in an earthquake, directly below the epicenter. fold - Bent rock strata. A planar feature, such as a bedding plane, that has been strongly warped by deformation. foliation - Any planar set of minerals or banding of mineral concentrations including cleavage, found in a metamorphic rock. foraminifera - A class of oceanic protozoa most of which have shells composed of calcite. foraminiferal ooze - A calcareous sediment composed of the shells of dead Foraminifera. forset bed - One of the inclined beds found in crossbedding; also an inclined bed deposited on the outer front of a delta. forsterite - The magnesium rich end-member of the olivine solid solution series (Mg2SiO4). Peridot is the gemstone variety of forsterite. formation - The basic unit for the naming of rocks in stratigraphy. A set of rocks that are or once were horizontally continuous, that share some distinctive feature of lithology, and are large enough to be mapped. fossil - An impression, cast, outline, or track of any animal or plant that is preserved in rock after the original organic material is transformed or removed. fossil fuel - A general term for combustible geologic deposits of carbon in reduced (organic) form and of biological origin, including coal, oil, natural gas, oil shales, peat and tar sands. fossil record - The totality of fossilized artifacts and their placement within the earth's rock strata. It provides information about the history of life on earth. fossiliferous - Rich in fossils. free oscillation - The ringing or periodic deformation of the whole Earth at characteristic low frequencies after a major earthquake. friction breccia - A breccia formed in a fault zone or volcanic pipe by the relative motion of two rock bodies. fringing reef - A coral reef that is directly attached to a landmass not made of coral. fumarole - A small vent in the ground from which volcanic gases and heated groundwater emerge, but not lava. Frequently, mineral deposits form around the vent. Ga - Abbreviation for gigaannum which is equal to 109 years, one billion years. gabbro - A type of dark, coarse-grained, intrusive mafic igneous rocks chemically equivalent to basalt. The rocks are plutonic, formed when molten magma is trapped beneath the Earth's surface and cools into a crystalline mass. geochronology - The science of absolute dating and relative dating of geologic formations and events, primarily through the measurement of daughter elements produced by radioactive decay in minerals. geologic cycle - The sequence through which rock material passes in going from its sedimentary form, through diastrophism and deformation of sedimentary rock, then through metamorphism and eventual melting and magma formation, then through volcanism and plutonism to igneous rock formation, and finally through erosion to form new sediments. geologic maps - Maps that show the types and ages of rock of an area. These maps are used by paleontologists to find areas that are likely to contain fossils. geologic time scale - A categorization of geological events based on successively smaller time spans: eons, eras, periods, epochs, and ages. The division is accomplished through stratigraphy and paleontology. geomorphic cycle - An idealized model of erosion wherein a plain is uplifted epeirogenically, then dissected by rapid streams (youth), then rounded by downslope movements into a landscape of steep hills (maturity), and finally reduced to a new peneplain at sea level (old age). geomorphology - The science of surface landforms and their interpretation on the basis of geology and climate. geosyncline - A major downwarp in the Earth's crust, usually more than 1000 kilometers in length, in which sediments accumulate to thicknesses of many kilometers. The sediments may eventually be deformed and metamorphosed during a mountain-building episode. geotherm or geothermal gradient - A plot of the curve that indicates the temperature of the Earth at various depths, i.e., a plot of temperature vs. depth. geyser - A hot spring that throws hot water and steam into the air. The heat is thought to result from the contact of groundwater with magma bodies. glacial rebound - Epeirogenic uplift of the crust that takes place after the retreat of a continental glacier, in response to earlier subsidence under the weight of the ice. glacial striation - Scratches left on bedrock and boulders by overriding ice, and showing the direction of motion. glacial valley - A valley occupied or formerly occupied by a glacier, typically with a U-shaped profile. glacier - A mass of ice and surficial snow that persists throughout the year and flows downhill under its own weight. The size range is from 100 meters to 10,000 kilometers. glacier surge - A period of unusually rapid movement of one glacier, sometimes lasting more than a year. glassiness - The content of extent of glass in an igneous rock. gneiss - A coarse-grained regional metamorphic rock that shows compositional banding and parallel alignment of minerals. graben - A downthrown block between two normal faults of parallel strike but converging dips; hence a tensional feature. See also horst. graded bedding - A bed in which the coarsest particles are concentrated at the bottom and grade gradually upward into fine silt, the whole bed having been deposited by a waning current. graded stream - A stream whose smooth profile is unbroken by resistant ledges, lakes, or waterfalls, and which maintains exactly the velocity required to carry the sediment provided to it. granite - A coarse-grained, highly felsic, intrusive igneous rock composed of quartz, orthoclase feldspar, sodic plagioclase feldspar, and micas. Also sometimes a metamorphic product. granitization - The formation of metamorphic granite from other rocks by recrystallization with or without complete melting. granular snow - Snow that has been transformed into small granules of ice. granulite - A metamorphic rock with coarse interlocking grains and little or no foliation. gravel - The coarsest of alluvial sediments, containing mostly particles larger than 2 mm in size and including cobbles and boulders. gravity anomaly - The difference between the observed acceleration of Earth's gravity and a value predicted from a model. gravity survey - The measurement of gravity at regularly spaced grid points with repetitions to control instrument drift. greenhouse effect - The heating of the atmosphere by the absorption of infrared energy re-emitted by the Earth as it receives light energy in the visible band from the Sun. greenschist - A metamorphic schist containing chlorite and epidote (which are green) and formed by low-temperature, low-pressure metamorphism. ground moraine - A glacial deposit of till with no marked relief, interpreted as having been transported at the base of the ice. groundwater - The mass of water in the ground below the phreatic zone, occupying the total pore space in the rock and moving slowly downhill where permeability allows. gully - A small steep-sided valley or erosional channel from 1 meter to about 10 meters across. guyot - A flat-topped submerged mountain or seamount found in the ocean. gyre - The circular rotation of the waters of each major sea, driven by prevailing winds and the Coriolis effect. hadean - The earliest eon in the history of the Earth from the first accretion of planetary material until the date of the oldest known rocks (4567 to 4000 million years ago). The name "Hadean" derives from the Greek Hades "Hell". half-life - The time required for half of a homogeneous sample of radioactive material to decay. hanging valley - A former glacial tributary valley that enters a larger glacial valley above its base, high up on the valley wall. hard water - Water that contains sufficient dissolved calcium and magnesium to cause a carbonate scale to form when the water is boiled or to prevent the sudsing of soap. harzburgite - an ultramafic variety of peridotite consisting mostly of olivine and low-calcium (Ca) pyroxene (enstatite). heat conduction - The transfer of the rapid vibrational energy of atoms and molecules, which constitutes heat energy, through the mechanism of atomic or molecular impact. heat engine - A device that transfers heat from a place of high temperature to a place of lower temperature and does mechanical work in the process. hematite - a mineral form of iron(III) oxide (Fe2O3). The color may vary from black to steel or silver-gray, brown to reddish brown, or red. hill - A natural land elevation, usually less than 1000 feet above its surroundings, with a rounded outline. The distinction between hill and mountain depends on the locality. hogback - A ridge formed by slower erosion of hard strata, but having two steep, equally inclined slopes. Hooke's Law - The principle that the stress within a solid is proportional to the strain. It holds only for strains of a few percent or less. hornfels - A high-temperature, low-pressure metamorphic rock of uniform grain size showing no foliation. Usually formed by contact metamorphism. horst - An elongate, elevated block of crust forming a ridge or plateau, typically bounded by parallel, outward-dipping normal faults. See also graben. hot spring - A spring whose waters are above both human body and soil temperature as a result of plutonism at depth. Compare with geyser. humus - The decayed part of the organic matter in a soil. hydration - A chemical reaction, usually in weathering, which adds water or hydroxyl groups (OH) to a mineral structure. hydraulic conductivity - A measure of the permeability of a rock or soil - the volume of flow through a unit surface in unit time with unit hydraulic pressure difference as the driving force. hydrocarbon - An organic chemical compound made up of carbon and hydrogen atoms arranged in chains or rings. hydrologic cycle - The cyclical movement of water from the ocean to the atmosphere, through rain to the surface, through runoff and groundwater to streams, and back to the sea. hydrology - The science of that part of the hydrologic cycle between rain and return to the sea; the study of water on and within the land. hydrothermal activity - Any process involving high-temperature groundwaters, especially the alteration and emplacement of minerals and the formation of hot springs and geysers. hydrothermal vein - A cluster of minerals precipitated by hydrothermal activity in a rock cavity. hydrothermal vent - A place on the seafloor, generally associated with spreading centers, where warm to super-hot, mineral-rich water is released; may support a diverse community of organisms. hypocenter - The point below the epicenter at which an earthquake actually begins; the focus. hypsometric diagram - A graph that shows in any way the relative amounts of the Earth's surface at different elevations with regard to sea level. ichnology - The study of trace fossils. igneous rock - Any rock solidified from molten or partly molten material. Igneous rock is called intrusive when formed below the surface, or extrusive when formed on the surface. 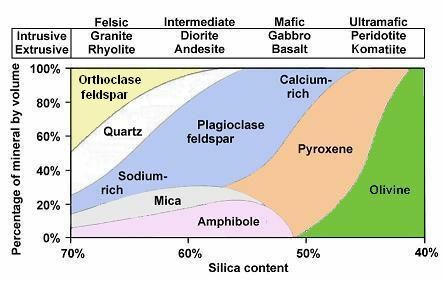 This chart shows that andesite is typically composed of plagioclase, amphibole, and mica; sometimes with minor amounts of pyroxene, quartz, or orthoclase. ignimbrite - An igneous rock formed by the lithification of volcanic ash and volcanic breccia. ilmenite - A weakly magnetic crystalline iron titanium oxide mineral (FeTiO3) which is iron-black or steel-gray. imbricate - The process of depositing clastic sediments with a preferential orientation of the composing grains. impressions - Prints or marks made when an organism’s body has been compressed (flattened). Impressions are different from compressions because no thin organic material is left behind. inclination - The angle between a line in the Earth's magnetic field and the horizontal plane; also a synonym for dip. index of refraction - The ratio of the speed of light in a vacuum to the speed in a material; this ratio determines the amount that light is refracted as it passes into a crystal. infiltration - The movement of groundwater or hydrothermal water into rock or soil through joints and pores. inosilicate - Mineral with interlocking single or double chains of silicate tetrahedra groups. Asbestos is an example of the fibrous structure of inosilicates. Pyroxenes are single-chain inosilicates, and amphiboles are double chain inosilicates. interbedded - Describes beds (layers) of rock lying between or alternating with beds of a different kind of rock. interfacial angle - The angle between two crystal faces of a crystal, characteristic of a mineral's symmetry. interior drainage - A system of streams that converge in a closed basin and evaporate without reaching the sea. intermontane basin - A basin between mountain ranges, often formed over a graben. intrusion - An igneous rock body that has forced its way in a molten state into surrounding pre-existing rock. Magma (and the rock it forms) that has pushed into pre-existing rock. intrusive - Rocks that form below the surface when magma solidifies. Synonym of plutonic; antonym of extrusive. ion - An atom or group of atoms that has gained or lost electrons and so has a net electric charge. ionic bond - A bond formed between atoms by electrostatic attraction between oppositely charged ions. iron formation - A sedimentary rock containing much iron, usually more than 15 percent as sulfide, oxide, hydroxide, or carbonate. island arc - A curved chain of islands that rise from the sea floor, usually near a continent. The convex side usually faces the open ocean, while the concave side usually faces the continent, e.g., the Aleutian Islands in Alaska; synonym of volcanic arc. isograd - A line or curved surface connecting rocks that have undergone an equivalent degree of metamorphism. isostasy - The mechanism whereby areas of the crust rise or subside until the mass of their topography is buoyantly supported or compensated by the thickness of crust below, which "floats" on the denser mantle. The theory that continents and mountains are supported by low-density crustal "roots." isotope - One of several forms of one element, all having the same number of protons in the nucleus, but differing in their number of neutrons and thus atomic weight. isotope geology - The study of the relative abundances of isotopes in rocks to determine their ages (see geochronology) or conditions of formation. isotropic substance - One in which the magnitude of a physical property, such as transmission of light is independent of crystallographic direction. joint - A large and relatively planar fracture in a rock across which there is no relative displacement of the two sides. juvenile gas - Gases that come to the surface for the first time from the deep interior. kame - A short, steep-sided knoll of glacial sediment. karst - A type of topography formed by dissolution of rocks like limestone and gypsum that is characterized by sinkholes, caves, and subterranean passages. Karst areas consist of chemically soluble rock such as limestone and gypsum. kerogen - A mixture of organic substances found in many fine-grained sedimentary rocks and a major constituent of oil shale. kettle - A small hollow or depression formed in glacial deposits when outwash was deposited around a residual block of ice that later melted. kilobar - A unit of pressure equal to 1000 bars. kimberlite - A peridotite containing garnet and olivine and found in volcanic pipes, through which it may come from the upper mantle. It can be associated with diamonds or gold. laccolith - A sill-like igneous intrusion that forces apart two strata and forms a round, lens-shaped body many times wider than it is thick. lacustrine - Relating to or associated with lakes. lahar - A mudflow of unconsolidated volcanic ash, dust, breccia, and boulders mixed with rain or the water of a lake displaced by a lava flow. laminar flow - A flow regime in which particle paths are straight or gently curved and parallel. landslide - The rapid downslope movement of soil and rock material, often lubricated by groundwater, over a basal shear zone; also the tongue of stationary material deposited by such an event. lapilli - A fragment of volcanic rock formed when magma is ejected into the air by expanding gases. The size of the fragments ranges from sand- to cobble-size. lateral moraine - A moraine formed along the side of a valley glacier and composed of rock scraped off or fallen from the valley sides. lava - Magma or molten rock that has reached the surface. The rocks that form from molten lava are classified as extrusive. lava tube - A sinuous, hollow tunnel formed when the outside of a lava flow cools and solidifies and the molten material passing through it is drained away. leaching - The removal of elements from a soil by dissolution in water moving downward in the ground. left-lateral fault - A strike-slip fault on which the displacement of the far block is to the left when viewed from either side. levee - A low ridge along a stream bank, formed by deposits left when floodwater decelerates on leaving the channel; also an artificial barrier to floods built in the same form. limb (fold) - The relatively planar part of a fold or of two adjacent folds (for example, the steeply dipping part of a stratum between an anticline and syncline). limestone - A sedimentary rock composed principally of calcium carbonate (CaCO3), usually as the mineral calcite. limy - Describes sediments, soils, or rocks that contain a significant amount of lime (calcium oxide, CaO). lineation - Any linear arrangement of features found in a rock. lithification - The processes that convert a sediment into a sedimentary rock. lithology - The systematic description of rocks, in terms of mineral composition and texture. lithosphere - The outer, rigid shell of the Earth, situated above the asthenosphere and containing the crust, continents, and plates. lode - An unusually large vein or set of veins containing ore minerals. loess - A widespread, loose deposit consisting mainly of silt; most loess deposits formed during the Pleistocene as an accumulation of wind-blown dust carried from deserts, alluvial plains, or glacial deposits. longitudinal dune - A long dune parallel to the direction of the prevailing wind. longitudinal profile - A cross section of a stream from its mouth to its head, showing elevation versus distance to the mouth. longshore current - A current that moves parallel to a shore and is formed from the momentum of breaking waves that approach the shore obliquely. longshore drift - The movement of sediment along a beach by swash and backwash of waves that approach the shore obliquely. lopolith - A large laccolith that is bowl-shaped and depressed in the center, possibly by subsidence of an emptied magma chamber beneath the intrusion. lowland - Land of general low relief at the lower levels of regional elevation. low-velocity zone - A region in the Earth, especially a planar layer that has lower seismic-wave velocities than the region immediately above it. luster - The general textural impression of a mineral surface, given by the light reflected from it. Terms such as metallic, submetallic are standardized but subjective. maar volcano - A volcanic crater without a cone, believed to have been formed by an explosive eruption of trapped gases. mafic - A term used to describe dense, dark-colored minerals rich in magnesium and iron, like pyroxene, amphibole, or olivine. Mafic rocks have specific gravities greater than 3. The word mafic derives from the constituents magnesium and ferrum (iron in Latin) with an adjectival ending. Complement of felsic. magma - Molten rock generated within the Earth that forms igneous rocks upon cooling. The rocks are called intrusive if the magma solidifies below the surface. Magma that reaches the surface is called lava, and the rocks that form when lava solidifies above the surface are classified as extrusive. magma chamber - A magma-filled cavity within the lithosphere. magmatic water - Water that is dissolved in a magma or that is derived from magma. magnetic anomaly - The value of the local magnetic field remaining after the subtraction of the dipole portion of the Earth's field. magnetic coupling - The transfer of momentum between celestial bodies, especially dust and gas clouds, through magnetic forces. magnetic north pole - (1) The point where the Earth's surface intersects the axis of the dipole that best approximates the Earth's field. (2) The point where the Earth's magnetic field dips vertically downward. magnetic stratigraphy - The study and correlation of polarity epochs and events in the history of the Earth's magnetic field as contained in magnetic rocks. magnetometer - An instrument for measuring either one orthogonal component or the entire intensity of the Earth's magnetic field at various points. magnitude - A measure of earthquake size, determined by taking the common logarithm (base 10) of the largest ground motion observed in a seismic surface wave and normalized to be the same as one at a distance of 100 km from the epicenter. manganese nodule - A small, rounded concretion found on the deep ocean floor that may contain as much as 20 percent manganese and smaller amounts of iron, copper, and nickel oxides and hydroxides. mantle - That portion of the interior of the Earth that lies between the crust and the core. marine terrace - A platform of marine deposits (typically sand, silt, gravel) sloping gently seaward. Such a platform may be exposed along the coast, forming cliffs, due to uplift and/or the lowering of sea level, e.g., Marine terraces of coastal Southern California. marl - A loose, crumbly deposit consisting of clay and calcium carbonate and formed in marine or freshwater conditions. massive rock - A rock that is little or not at all broken by joints, cracks, foliation, or bedding, tending to present a homogeneous appearance. mass movement - A downhill movement of soil or fractured rock under the force of gravity. mass spectrometer - An instrument for separating ions of different mass but equal charge (mainly isotopes in geology) and measuring their relative quantities. maturity - A stage in the geomorphic cycle in which maximum relief and well-developed drainage are both present. meander - Broad, semicircular curves in a stream that develop as the stream erodes the outer bank of a curve and deposits sediment against the inner bank. mechanical weathering - The set of all physical processes by which an outcrop is broken up into small particles. medial moraine - A long stripe of rock debris carried on or within a glacier resulting from the convergence of lateral moraines where two glaciers join. medical geology - The application of geologic science to problems of health, especially those relating to mineral sources of toxic or nutritious elements and natural dispersal of toxic pollutants. melange - A body of rocks consisting of large blocks (mappable size) of different rocks jumbled together with little continuity of contacts. Mercalli scale - A subjective scale for measuring the intensity of an earthquake based on how the earthquake is perceived by people and on the amount of destruction caused by the tremors. mesa - A land formation, less extensive than a plateau, having steep walls and a relatively flat top. mesophere - The lower mantle. mesoproterozoic - an era (1600 to 1000 mya) with three periods: Calymmian, Ectasian, and Stenian. metamorphic rock - Any rock derived from other rocks by chemical, mineralogical and structural changes resulting from pressure, temperature or shearing stress. metamorphism - The process of altering the chemical or mineralogical composition of a rock by pressure and temperature in the Earth's interior. meteoric water - Rainwater, snow, hail, and sleet, as opposed to ground water. meteorite - A stony or metallic object from inter-planetary space that penetrates the atmosphere to impact on the surface. microfossil - A very small fossil, best studied with the aid of a microscope, such as foraminifera, radiolarians, and small vertebrate fossils. micrometeorite - A meteorite less than 1 millimeter in diameter. microseism - A weak vibration of the ground that can be detected by seismographs and which is caused by waves, wind, or human activity, but not by an earthquake. mid-oceanic ridges - Elongated rises on the ocean floor where basalt periodically erupts, forming new oceanic crust; similar to continental rift zones. migmatite - A rock with both igneous and metamorphic characteristics that shows large crystals and laminar flow structures. Probably formed metamorphically in the presence of water and without melting. mineral - A naturally occurring, homogeneous inorganic solid substance having a definite chemical composition and characteristic crystalline structure. The term is sometimes loosely used for coal and petroleum products, e.g., mineral oil. mineralization - The process through which an organic substance becomes impregnated by inorganic substances and becomes fossilized or petrified. mineralogy - The study of chemistry, crystal structure, and physical (including optical) properties of minerals..
miocene epoch - An epoch from 23.03 to 5.3 million years ago with six Ages: Aquitanian, Burgidalian, Langhian, Serravalian, Tortonian, and Messinaian. miogeosyncline - A Geosyncline that is situated near a craton and receives chemical and well-sorted elastic sediments from the continent. Mohorovicic discontinuity - The boundary between crust and mantle, marked by a rapid increase in seismic wave velocity to more than 8 kilometers per second. Depth - 5 to 45 kilometers. Abbreviated "Moho" or "M-discontinuity." Mohs scale of hardness - An empirical, ascending scale of mineral hardness with talc as 1, gypsum 2, calcite 3, fluorite 4, apatite 5, orthoclase 6, quartz 7, topaz 8, corundum 9, and diamond 10.
molds - Fossils formed when the sediment surrounding a buried organism hardens. When the organism decays, its impression is left in the rock and can be seen if the rock is broken open. monadnock - An isolated hill or mountain rising above a peneplain. monocline - A set of rock layers that all slope downward from the horizontal in the same direction. moraine - A glacial deposit of sediment left at the margin of an ice sheet. Lateral moraine - deposited to the side of a glacier. Terminal moraine - deposited to the front of a glacier. Ground moraine - deposited on the land surface. mountain - A steep-sided topographic elevation larger than a hill; also a single prominence forming part of a ridge or mountain range. mudflow - A mass movement of material finer than sand, lubricated with large amounts of water. mudstone - A fine-grained sedimentary rock similar to shale but more massive. muscovite - A phyllosilicate mineral, also known as common mica, with formula KAl2(AlSi3O10)(OH)2. It readily cleaves into thin transparent sheets. My. - Abbreviation for "million years". mya - million years ago. mylonite - A fine-grained metamorphic rock formed by ductile deformation during intense shearing encountered at fault boundaries. nappe - A mass of rock that has been forced over another rock mass, typically on a low angle thrust fault plane. native metal - A natural deposit of a metallic element in pure metallic form, neither oxidized nor combined with sulfur or other elements. neap tide - A tide cycle of unusually small amplitude, which occurs twice monthly when the lunar and solar tides are opposed-that is, when the gravitational pull of the Sun is at right angles to that of the Moon. nebula - An immense, diffuse body of interstellar gas and dust that has not condensed into a star. nebular hypothesis - A theory of the formation of the planets that states that a rotating nebula contracted and was then torn into fragments by centrifugal forces, with planets condensing from the fragments. neogene - A period from 23.03 mya to today. This is the name given to the time starting from the Miocene Epoch to today. neoproterozoic - An era (1000 to 542 mya) with three periods: Tonian, Cryogenian, and Ediacaran. nesosilicate - Mineral with isolated silicate tetrahedra. Also called orthosilicate. neutron - An electrically neutral elementary particle in the atomic nucleus having the mass of one proton. neutron-activation analysis - A method of identifying isotopes of an element by bombarding them with neutrons and observing the characteristic radioactive decay products emitted. norite - A mafic intrusive igneous rock composed largely of calcium-rich plagioclase and olivine. normal fault - A dip-slip fault in which the block above the fault has moved downward relative to the block below. oblique-slip fault - A fault that combines some strike slip motion with some dip-slip motion. obsidian - Dark volcanic glass of felsic composition. oceanic crust - The Earth's crust which is formed at mid-oceanic ridges. oceanic trench - Deep steep-sided depression in the ocean floor caused by the subduction of oceanic crust beneath another oceanic crust or a continental crust. octahedral coordination - The packing of six ions around an ion of opposite charge to form an octahedron. oil field - An underground accumulation of oil and gas concentrated beneath an impermeable trap, preventing its escape upward. oil shale - A dark-colored shale containing organic material that can be crushed and heated to liberate gaseous hydrocarbons. old age - A stage in the geomorphic cycle, characterized by formation of a peneplain near sea level. oligocene epoch - An epoch from 33.9 to 23.03 million years ago with two Ages: Rupelian and Chattian. olivine A magnesium iron silicate with the formula (Mg,Fe)2SiO4. It is a common mineral below the Earth's surface but weathers quickly on the surface. Peridot is gem-quality olivine that approaches the formula of forsterite Mg2SiO4. Fayalite (Fe2SiO4) is the iron-rich end-member of the olivine solid-solution series. oolite - A sedimentary carbonate particle composed of spherical grains precipitated from warm ocean water on carbonate platforms. Also a rock composed of such particles. opaque mineral - A mineral which transmits no light through a thin section under a microscope. Usually a native metal, sulfide, or metallic oxide mineral. ophiolite suite - An assemblage of mafic and ultramafic igneous rocks with deep-sea sediments supposedly associated with divergence zones and the sea-floor environment. 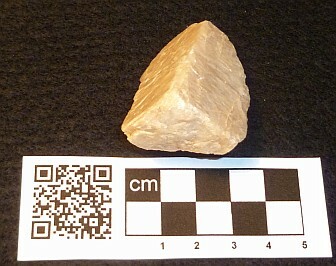 optically-stimulated luminescence (OSL) - A dating technique used to determine the last time quartz sediment was exposed to light. orbit - The elliptical or hyperbolic path traced by a planet or meteorite or satellite in the presence of a more massive body. ore - A natural deposit in which a valuable metallic element occurs in high enough concentration to make mining economically feasible. ore mineral - The mineral of an ore that contains the useful element. original horizontality, principle of - The proposition of Steno, that all sedimentary bedding is horizontal at the time of deposition. 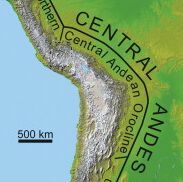 The Central Andean Orocline where the Nazca plate meets the South American plate. orocline - A bend about a vertical axis formed by buckling of an originally linear orogen. An orogenic belt with an imposed curvature or sharp bend. orogenic belt - A linear region, often a former geo-syncline, that has been subjected to folding, and other deformation in a mountain-building episode. orogen - A mountain formation. orogeny - The tectonic processes of folding, faulting, and uplifting of the Earth’s crust that result in the formation of mountains. orthoclase - A common constituent of most granites and other felsic igneous rocks. Alternate names are potassium feldspar and K-feldspar. It has the general formula KAlSi3O8. oscillation ripple - A ripple with a symmetrical cross section and a sharp peak formed by waves. outcrop - Any place where bedrock is visible on the surface of the Earth. outgassing - The release of gases to the atmosphere and oceans by volcanism. outwash - A glaciofluvial sediment that is deposited by meltwater streams emanating from a glacier. 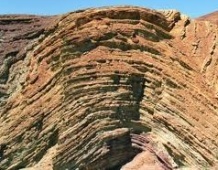 Overturned fold - A fold in which a limb has tilted past vertical so that the older strata are uppermost. Oxbow lake - A long, broad, crescent-shaped lake formed when a stream abandons a meander and takes a new course. oxidation - A chemical reaction in which electrons are lost from an atom and its charge becomes more positive. oxidized element - An element occurring in the more positively charged of two common ionic forms. 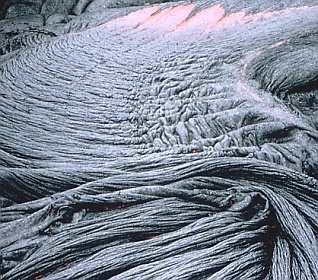 pahoehoe - A basaltic lava flow with a glassy, smooth, and undulating, or ropy, surface. paleoclimate - The average state or typical conditions of climate during some past geologic period. paleocurrent map - A map of depositional currents that have been inferred from cross-bedding, ripples, or other sedimentary structures. paleogeographic map - A map showing the surface landforms and coastline of an area at some time in the geologic past. paleomagnetism - The science of the reconstruction of the Earth's ancient magnetic field and the positions of the continents from the evidence of remnant magnetization in ancient rocks. paleoproterozoic - An era (2500 to 1600 mya) with four periods: Siderian, Rhyacian, Orosirian, and Statherian. paleosol - Soil horizon from the geologic past. paleontology - The science of fossils, of ancient life-forms, and their evolution. paleowind - A prevailing wind direction in an area, inferred from dune structure or the distribution of volcanic ash for one particular time in geologic history. pangaea - A great proto-continent from which all present continents have broken off by the mechanism of sea-floor spreading and continental drift. panthalassa - A hypothetical primeval ocean covering two-thirds of the world except for the continent of Pangaea. parent element - An element that is transformed by radioactive decay to a different (daughter) element. peat - A marsh or swamp deposit of water-soaked plant remains containing more than 50 percent carbon. pedalfer - A common soil type in humid regions, characterized by an abundance of iron oxides and clay minerals deposited in the B-horizon by leaching. pediment - A planar, sloping rock surface forming a ramp up to the front of a mountain range in an arid region. It may be covered locally by thin alluvium. pedocal - A common soil type of arid regions, characterized by accumulation of calcium carbonate in the A-horizon. pegmatite - An igneous rock with extremely large grains, more than a centimeter in diameter. It may be of any composition but most frequently is granitic. pelagic sediment - Deep-sea sediments composed of fine-grained detritus that slowly settles from surface waters. Common constituents are clay, radiolarian ooze, and foraminiferal ooze. peneplain - An extensive area of low elevation and relief produced by a long period of erosion and representing the end product of the ideal geomorphic cycle. perched groundwater - An isolated body of ground-water that is perched above and separated from the main water table by an aquiclude. peridot - A gem-quality form of olivine, (Mg,Fe)2SiO4, with Mg in greater quantities than Fe. peridotite - A coarse-grained mafic igneous rock composed mainly of olivine and pyroxene. Peridotite is the dominant rock of the upper part of the Earth's mantle. perovskite - A calcium titanium oxide mineral composed of calcium titanate, with the chemical formula CaTiO3. The cubic structure of perovskite is adopted by many oxides that have the chemical formula ABO3, where A and B are metal atoms. petrology - the branch of geology that studies the origin, chemical composition, distribution and structure of rocks. phaneritic - An igneous rock in which the matrix grains are large enough to be distinguished with the unaided eye. Opposite of aphanitic. phanerozoic - The most recent eon of geologic time beginning 542 million years ago and continuing to the present. Derived from the Greek phaneros "visible" + zoe "life". It comprises the the Paleozoic, Mesozoic, and Cenozoic eras. phreatic zone - Zone of saturation. The area in an aquifer, below the water table, in which relatively all pores and fractures are saturated with water. phyllosilicate - Mineral with parallel sheets of silicate tetrahedra, such as mica. piedmont - A gentle slope leading from the foot of mountains to a region of flat land. pillow lava - Lava extruded beneath water characterised by pillow-type shapes. plagioclase - A type of feldspar containing various proportions of anorthite (CaAl2Si2O8) and albite (NaAlSi3O8). plate - Rigid parts of the Earth's crust and part of the Earth's upper mantle that move and adjoin each other along zones of seismic activity. plate tectonics - The theory that the crust and part of the mantle are divided into plates that interact with each other causing seismic and tectonic activity. pliocene epoch - An epoch from 5.3 to 2.58 million years ago with two Ages: Zanclean and Piacenzian. pluton - Any body of igneous rock that solidified below the Earth’s surface. plutonic - A term applied to igneous rocks formed beneath the surface of the Earth, typically with large crystals due to the slowness of cooling. Synonym of intrusive. Antonym of volcanic. potable water - Water that is agreeable to the taste and not dangerous to the health. pothole - A semispherical hole in the bedrock of a stream bed, formed by abrasion of small pebbles and cobbles in a strong current. ppm - Abbreviation for "parts per million." Pratt isostatic compensation - The mechanism in which variations in crustal density act to counterbalance the varying weight of topographic features. The crust is here assumed to be of approximately uniform thickness, thus a mountain range would be underlain by lighter rocks. precambrian - Geologic time (4567 to 542 mya) from the beginning of the Earth to the beginning of the Cambrian Period of the Paleozoic Era. preferred orientation - Any deviation from randomness in the distribution of the crystallographic or grain shape axes of minerals of a rock (including flow cleavage and foliation), produced by deformation and non-uniform stress during crystallization in metamorphic rocks or by depositional currents in sediments. proterozoic - The geologic eon between the Archean and Phanerozoic eons, beginning about 2500 and ending 542 million years ago. Derived from the Greek proteros "earlier" + zoe "life". The Proterozoic eon is divided into the Paleoproterozoic era, Mesoproterozoic era, and Neoproterozoic era. proto-sun - A large cloud of dust and gas gradually coalescing into a star under the force of gravity. proven reserves - Deposits of fossil fuels whose location and extent are known, as opposed to potential but unproved ("discovered") deposits. pumice - A solidified frothy lava typically created when super-heated, highly pressurized rock is violently ejected from a volcano. Pumice has a low density and floats on water. P-wave - The primary or fastest wave traveling away from a seismic event through the solid rock, and consisting of a train of compressions and dilations of the material along the path of the wave. See seismogram. pyroclastic rock - A rock formed by the accumulation of fragments of volcanic rock scattered by volcanic explosions. pyroclastic texture - The unsorted, angular, and un-rounded texture of the fragments in a pyroclastic rock. pyroxene - Silicate compounds frequently found in volcanic lava with the general formula XYT2O6 where T represents the tetrahedrally coordinated cations silicon (Si+4) or aluminum (Al+3), X commonly represents magnesium (Mg+2), iron (Fe+2), manganese (Mn+2), calcium (Ca+2) or sodium (Na+), and Y commonly represents aluminum (Al+3), iron (Fe+3), titanium (Ti+4), chromium (Cr+3), magnesium (Mg+2) or manganese (Mn+2). Minerals in the pyroxene group are abundant in both igneous and metamorphic rocks. There are twenty accepted pyroxene mineral names. pyroxene granulite - A coarse-grained contact metamorphic rock containing pyroxene, formed at high temperatures and low pressures. quartz - The second-most-abundant mineral in the Earth's continental crust, after feldspar. Quartz consists of silicon dioxide (SiO2). Quartz arenite - A sandstone containing very little except pure quartz grains and cement. quartzite - (1) A very hard, clean, white metamorphic rock formed from a quartz arenite sandstone. (2) A quartz arenite containing so much cement that it resembles (1). radial drainage - A system of streams running in a radial pattern away from the center of a circular elevation, such as a volcano or dome. radiative transfer - One mechanism for the movement of heat, in which it takes the form of long-wavelength infrared radiation. radio-carbon dating - Method for determining the age of an organic substance by measuring the amount of the carbon isotope, carbon-14, remaining in the substance; useful for determining ages in the range of 500 to 70,000 years. radiolarian - A class of one-celled marine animals with siliceous skeletons that have existed in the ocean throughout the Phanerozoic Eon. radiolarian ooze - A siliceous deep-sea sediment composed largely of the skeletons of radiolaria. radiolarite - The lithified sedimentary rock formed from radiolarian ooze. ray - A linear landform of the lunar surface emanating from a large crater and extending as much as 100 kilometers outward, probably consisting of fine ejecta thrown out by the impact of a meteorite. reaction series - A series of chemical reactions occurring in a cooling magma by which a mineral formed at high temperature becomes unstable in the melt and reacts to form another mineral. rebound - The uplifting of a land mass after a weight has been removed. recharge - In hydrology, the replenishment of ground-water by infiltration of meteoric water through the soil. recrystallization - The growth of new mineral grains in a rock at the expense of old grains, which supply the material. rectangular drainage - A system of streams in which each straight segment of each stream takes one of two characteristic perpendicular directions, with right-angle bends between. The streams are usually following two perpendicular sets of joints. recumbent fold - An overturned fold with both limbs nearly horizontal. red bed - Sedimentary layers composed primarily of sandstone, siltstone, and shale, that are predominantly red in color due to the presence of iron oxides. reef - A large ridge or mound-like structure within a body of water that is built by calcareous organisms such as corals, red algae, and bivalves. Barrier reef - A reef growing offshore from a land mass and separated by a lagoon or estuary. refraction (wave) - The departure of a wave from its original direction of travel at the interface with a material of different index of refraction (light) or seismic wave velocity. regional metamorphism - Metamorphism occurring over a wide area and caused by deep burial and high internal temperatures of the Earth. regolith - Any solid material lying on top of bedrock. Includes soil, alluvium, and rock fragments weathered from the bedrock. regression - A drop in sea level that causes an area of the Earth to be uncovered by seawater, ending marine deposition. relief - The maximum regional difference in elevation. remote sensing - The study of Earth surface conditions and materials from airplanes and satellites by means of photography, spectroscopy, or radar. replacement deposit - A deposit of ore minerals by hydrothermal solutions that have first dissolved the original mineral to form a small cavity. reversible reaction - A chemical reaction which can proceed in either direction, depending on the concentration of reacting materials. rheidity - (1) The ability of a substance to yield to viscous flow under large strains. (2) One thousand times the time required for a substance to stop changing shape when stress is no longer applied. rhyolite - An igneous, volcanic (extrusive) rock, of felsic (silica-rich) composition, typically more than 69% silicon dioxide, SiO2. Rhyolite usually exhibits flow lines. Richter magnitude scale - An objective scale for measuring earthquake energy. See magnitude. ridge (mid-ocean) - A major linear elevated landform of the ocean floor, from 200 to 20,000 kilometers in extent. It is not a single ridge, but resembles a mountain range and may have a central rift valley. rift - A long, narrow crack in the entire thickness of the Earth's crust, which is bounded by normal faults on either side and forms as the crust is pulled apart. rift valley - A linear-shaped lowland between highlands or mountain ranges created by the action of a geologic rift or fault. right-lateral fault - A strike-slip fault on which the displacement of the far block is to the right when viewed from either side. ring dike - A dike in the form of a segment of a cone or cylinder, having an arcuate outcrop. rip current - A current that flows strongly away from the sea shore through gaps in the surf zone at intervals along the shoreline. ripple - A very small dune of sand or silt whose long dimension is formed at right angles to the current. river order - See stream order. rock - A naturally occurring solid aggregate of one or more minerals. rock cycle - The geologic cycle, with emphasis on the rocks produced; sedimentary rocks are metamorphosed to metamorphic rocks, or melted to create igneous rocks, and all rocks may be uplifted and eroded to make sediments, which lithify to sedimentary rocks. rock flour - A glacial sediment of extremely fine (silt-and clay-size) ground rock formed by abrasion of rocks at the base of the glacier. rock glacier - A glacier-like mass of rock fragments or talus with interstitial ice that moves downhill under the force of gravity. rockslide - A landslide involving mainly large blocks of detached bedrock with little or no soil or sand. rounding - The degree to which the edges and corners of a particle become worn and rounded as a result of abrasion during transportation. Expressed as angular, subrounded, well-rounded, etc. runoff - The amount of rain water directly leaving an area in surface drainage, as opposed to the amount that seeps out as groundwater. rupture strength - The greatest stress that a material can sustain without fracturing at one atmosphere pressure. salt lick - A natural or artificial deposit of exposed salt that animals lick for nutrients. saltation - The movement of sand or fine sediment by short jumps above the ground or stream bed under the influence of a current too weak to keep it permanently suspended. sandblasting - A physical weathering process in which rock is eroded by the impact of sand grains carried by the wind, frequently leading to ventifact formation of pebbles and cobbles. sandstone - Sedimentary rock composed of small grains of mainly quartz and feldspar bound together by silica, carbonate, or clay minerals. schist - A metamorphic rock characterized by strong foliation or schistosity. saprolite - A rock chemically disintegrated in its original place as a result of deep weathering of the bedrock surface. schistosity - The parallel arrangement of shaly or prismatic minerals like micas and amphiboles resulting from nonhydrostatic stress in metamorphism. scoria - Congealed lava, usually of mafic composition, with a large number of vesicles formed by gases coming out of solution. sea-floor spreading - The mechanism by which new sea floor crust is created at ridges in divergence zones as magma wells up and forces previously formed crust apart. seamount - An isolated tall mountain on the sea floor that may extend more than 1 kilometer from base to peak (see also guyot). secular variation - Slow changes in the orientation of the Earth's magnetic field that appear to be long lasting and internal in origin as opposed to rapid fluctuations, which are external in origin. sediment - Any solid material that has settled out of a state of suspension in liquid. sedimentary rock - A rock formed by the accumulation and cementation of mineral grains transported by wind, water, ice or chemically precipitated at the deposition site. sedimentary structure - Any structure of a sedimentary or weakly metamorphosed rock that was formed at the time of deposition; includes bedding, cross-bedding, graded bedding, ripples, scour marks, mud-cracks. sedimentation - The process of deposition of mineral grains or precipitates in beds or other accumulations. seif dune - A longitudinal dune that shows the sculpturing effect of cross-winds not parallel to its axis. seismic discontinuity - A surface within the Earth across which P-wave or S-wave velocities change rapidly, usually by more than +~0.2 kilometer/second. seismicity - The world-wide or local distribution of earthquakes in space and time; a general term for the number of earthquakes in a unit of time. seismic profile - The data collected from a set of seismographs arranged in a straight line with an artificial seismic source, especially the times of P-wave arrivals. seismic reflection - A mode of seismic prospecting in which the seismic profile is examined for waves that have reflected from near-horizontal strata below the surface. seismic refraction - A mode of seismic prospecting in which the seismic profile is examined for waves that have been refracted upward from seismic discontinuities below the profile. Greater depths may be reached than through seismic reflection. seismic surface wave - A seismic wave that follows the Earth's surface only, with a speed less than that of S-waves. There are Raleigh waves (forward and vertical vibrations) and Love waves (transverse vibrations). seismic transition zone - A seismic discontinuity, found in all parts of the Earth, at which the velocity increases rapidly with depth; especially the one at 300 to 600 kilometers. seismogram - A record made by a seismometer of the ground motion as a function of time. siderite - A mineral, also called ironstone, composed of iron carbonate FeCO3. silica - An oxide of silicon with the chemical formula SiO2. It is most commonly found in nature as quartz or as a component of sand. silcrete - a hardened rock formed when silica is dissolved from the soil and resolidifies as a cement. Heating silcrete in a fire makes the rock more suitable for making stone tools by pressure flaking. Nesosilicates or orthosilicates have isolated silicate tetrahedra. Sorosilicates have isolated silicate tetrahedra linked in pairs. Cyclosilicates have silicate tetrahedra groups linked in 3- or 6-member rings. Inosilicates have interlocking single or double chains of silicate tetrahedra groups. Phyllosilicates form parallel sheets of silicate tetrahedra. Tectosilicates have a three-dimensional framework of silicate tetrahedra. silicification - Process whereby silica replaces the original material of a substance, such as wood. sill - A sheet-like igneous intrusion that parallels the plane of the surrounding rock. sinkhole - A natural depression in the surface of the land caused by the collapse of the roof of a cavern or subterranean passage, generally occurring in limestone regions. soil - Unconsolidated materials above bedrock. sorosilicate Mineral with isolated silicate tetrahedra linked in pairs. stratification - A structure of sedimentary rocks, which have recognizable parallel beds of considerable lateral extent. stratigraphic sequence - A set of beds deposited that reflects the geologic history of a region. stratigraphy - The study of rock layers and classification of strata in sedimentary rocks, including the interpretation of the depositional environments of those strata. stratovolcano - A volcanic cone consisting of both lava and pyroclastic rocks, often conical. 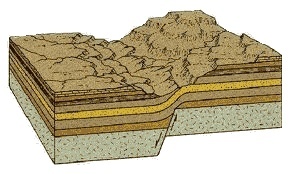 stratum - A layer of sedimentary rock; plural is strata. streak - The fine deposit of mineral dust left on an abrasive surface when a mineral is scraped across it; especially the characteristic color of the dust. streak plate - A ceramic abrasive surface for streak tests. streamline - A curved line representing the successive positions of a particle in a flow as time passes. stream order - The hierarchical number of a stream segment in dendritic drainage - the smallest tributary streams have order one and at each junction of streams of equal order the order of the subsequent segment is one higher. stress - A quantity describing the forces acting on each part of a body in units of force per unit area. striation - See glacial striation. strike - The angle between true North and the horizontal line contained in any planar feature (inclined bed, dike, fault plane, etc. ); also the geographic direction of this horizontal line. strike-slip fault - A fault whose relative displacement is purely horizontal. stromatolite - Petrified layered structures created by sedimentation of microorganisms in shallow water. subduction - A geologic process in which one edge of one crustal plate is forced below the edge of another. subduction zone - A dipping planar zone descending away from a trench and defined by high seismicity, interpreted as the shear zone between a sinking oceanic plate and an overriding plate. sublimation - A phase change from the solid to the gaseous state, without passing through the liquid state. submarine canyon - An underwater canyon in the continental shelf. subsidence - A gentle sinking or gradual downward settling of the crust without appreciable deformation or horizontal motion. superposed stream - A stream that flows through resistant formations because its course was established at a higher level on uniform rocks before down-cutting began. superposition, principle of - The principle that, except in extremely deformed strata, a bed that overlies another bed is always the younger. supersaturation - The unstable state of a solution that contains more solute than its solubility allows. surf zone - An offshore belt along which the waves collapse into breakers as they approach the shore. surface waves - Mechanical surface waves that are the slowest waves of an earthquake tremor, but which cause the most destruction. See seismogram. suspended load - The fine sediment kept suspended in a stream because the settling velocity is lower than the upward velocity of eddies. swash - The landward rush of water from a breaking wave up the slope of the beach. S-wave - The secondary seismic wave, traveling slower than the P-wave, and consisting of elastic vibrations transverse to the direction of travel. It cannot penetrate a liquid. See seismogram. swell - An oceanic water wave with a wavelength on the order of 30 meters or more and a height of perhaps 2 meters or less that may travel great distances from its source. symbiosis - The interaction of two mutually supporting species that do not compete with or prey upon each other. syncline - A fold of rock layers with a convex side toward the Earth; a fold with the youngest strata in the center. Antonym of anticline. system (stratigraphy) - A stratigraphic unit larger than a series, consisting of all the rocks deposited in one period of an era. tableland - A large elevated region with a relatively low relief surface. taphonomy - The study of what happens to a fossil, from the time of deposition to the time that the fossil is discovered. tar sand - A sandstone containing the densest asphaltic components of petroleum - the end-product of evaporation of volatile components or of some thickening process. talus - A deposit of large angular fragments of physically weathered bedrock, usually at the base of a cliff or steep slope. tectonics - The study of the movements and deformation of the crust on a large scale, including epeirogeny, metamorphism, folding, faulting, and plate movements. tectosilicate - Mineral with a three-dimensional framework of silicate tetrahedra. This is the most common form of minerals in the Earth's crust, which include quartz and feldspar. terminal moraine - A sinuous ridge of unsorted glacial till deposited by a glacier at the line of its farthest advance. terrane - A general term used to refer to a piece of the crust that is usually smaller than a continent but larger than an island. terrestrial planet - A planet similar in size and composition to the Earth; especially Mars, Venus, and Mercury. terrestrial sediment - A deposit of sediment that accumulated above sea level in lakes, alluvial fans, floodplains, moraines, etc., regardless of its present elevation. texture (rock) - The rock characteristics of grain or crystal size, size variability, rounding or angularity, and preferred orientation. thalweg - A sinuous imaginary line following the deepest part of a stream. thermal conductivity - A measure of a rock's capacity for heat conduction. thermal expansion - The property of increasing in volume as a result of an increase in internal temperature. thermonuclear reaction - A reaction in which atomic nuclei fuse into new elements with a large release of heat; especially a reaction that is self-sustaining. Occasionally used to include fission reactions as well. thermokarst - Land surface in Arctic areas characterised by very irregular surfaces of marshy hollows and small mounds formed when ice-rich permafrost thaws. thermoremanent magnetization - A permanent magnetization acquired by igneous rocks in the presence of the Earth's magnetic field as they cool below the Curie point. tidal current - A horizontal displacement of ocean water under the gravitational influence of Sun and Moon, causing the water level to rise relative to the coast at high tide and decrease in level at low tide. tidal flat - A broad, flat region of muddy or sandy sediment, covered and uncovered in each tidal cycle. till - An unconsolidated sediment containing all sizes of fragments from clay to boulders deposited by glacial action, usually unstratified. time scale - See Geologic time scale. topographic map - See contour map; also a schematic drawing of prominent landforms indicated by conventionalized symbols, such as hachures or contours. topography - The shape of the Earth's surface, above and below sea level; the set of landforms in a region; the distribution of elevations. topset bed - A horizontal sedimentary bed formed at the top of a delta and overlying the foreset beds. trace element - An element that appears in minerals in a concentration of less than 1 percent (often less than 0.001 percent). trace fossil - Evidence left by organisms, such as burrows, imprints, coprolites, or footprints. Trace fossils are not preserved parts of the organism. transform fault - A strike-slip fault connecting the ends of an offset in a mid-ocean ridge. Some pairs of plates slide past each other along transform faults. transgression - A rise in sea level relative to the land which causes areas to be submerged and marine deposition to begin in that region. transition element - Any element belonging to one of three series of elements with atomic numbers between 21 and 30, 39 and 48, and 57 and 80. They are characterized by multiple valences, colored compounds, and the ability to form stable complex ions. See the Periodic Table. transpiration - The removal of water from the ground into plants, ultimately to be evaporated into the atmosphere by them. transverse dune - A dune that has its axis transverse to the prevailing winds or to a current. The upwind or upcurrent side has a gentle slope, and the downwind side lies at the angle of repose. trap (oil) - A sedimentary or tectonic structure that impedes the upward movement of oil and gas and allows it to collect beneath the barrier. travel-time curve - A curve on a graph of travel time versus distance for the arrival of seismic waves from distant events. Each type of seismic wave has its own curve. travertine - A terrestrial deposit of limestone formed in caves and around hot springs where cooling, carbonate-saturated groundwater is exposed to the air. trellis drainage - A system of streams in which tributaries tend to lie in parallel valleys formed in steeply dipping beds in folded belts. trench - A long and narrow deep trough in the sea floor; interpreted as marking the line along which a plate bends down into a subduction zone. triple junction - A point that is common to three plates and which must also be the meeting place of three boundary features, such as divergence zones, convergence zones, or transform faults. tsunami - A large destructive wave caused by sea-floor movements in an earthquake. tuff - A consolidated rock composed of pyroclastic fragments and fine ash. If particles are melted slightly together from their own heat, it is a "welded tuff." 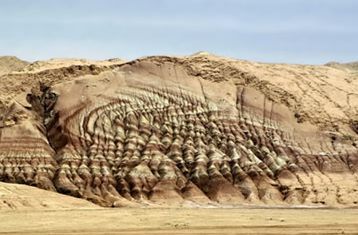 turbidite - The sedimentary deposit of a turbidity flow, typically showing graded bedding and sedimentary structures on the undersides of the sandstones. turbidity current - A mass of mixed water and sediment that flows downhill along the bottom of an ocean or lake because it is denser than the surrounding water. It may reach high speeds and erode rapidly (see also density current). turbulent flow - A high-velocity flow in which streamlines are neither parallel nor straight but curled into small tight eddies (compare Laminar flow). ultramafic rock - An igneous rock consisting dominantly of mafic minerals high in iron and magnesium, containing less than 10 percent feldspar. Includes dunite, peridotite, amphibolite, and pyroxenite. unconformity - Any interruption of the continuity of a depositional sequence. unconsolidated material - Nonlithified sediment that has no mineral cement or matrix binding its grains. uniformitarianism - The concept that the processes that have shaped the Earth through geologic time are the same as those observable today. unit cell - The smallest contiguous group of atomic structural units in a mineral that can be repeated in three directions to form a crystal. upland - An area that is higher relative to the surrounding areas, but not mountainous. Synonym of highland. The opposite of lowland. uplift - The process or result of raising a portion of the Earth’s crust through different tectonic mechanisms. upwelling current - The upward movement of cold bottom water in the sea, which occurs when wind or currents displace the lighter surface water. U-shaped valley - A deep valley with steep upper walls that grade into a flat floor, usually eroded by a glacier. vadose zone - The region in the ground between the surface and the water table in which pores are not filled with water. Also called the unsaturated zone. valence electron - An electron of the outermost shell of an atom; one of those most active in bonding. valley glacier - A glacier that is smaller than a continental glacier or an icecap, and which flows mainly along well-defined valleys, many with tributaries. Van der Waals bond - A bond much weaker than the ionic or covalent, which bonds atoms by small electrostatic attraction. varve - A thin layer of sediment grading upward from coarse to fine and light to dark, found in a lake bed and representing one year's deposition of glacial outwash. vein - A deposit of foreign minerals within a rock fracture or joint. ventifact - Rocks that have been abraded, pitted, etched, grooved, or polished by wind-driven sand or ice crystals. vertical exaggeration - The ratio of the horizontal scale to the vertical scale (for example, 500:1) in an illustration. vesicle - A cavity in an igneous rock that was formerly occupied by a bubble of escaping gas. viscosity - A measure of resistance to flow in a liquid. volcanic - The action or process of magma and gases rising to the crust and being extruded onto the surface and into the atmosphere; also applies to the resulting igneous rocks that cool on the surface of the Earth, including beneath water. volcanic arc - A curved chain of islands that rise from the sea floor, usually near a continent. The convex side usually faces the open ocean, while the concave side usually faces the continent. Synonym for island arc. volcanic ash - A volcanic sediment of rock fragments, usually glass, less than 4 millimeters in diameter that is formed when escaping gases force out a fine spray of magma. volcanic ash fall - A deposit of volcanic ash resting where it was dropped by eruptions and winds. volcanic ash flow - A mixture of volcanic ash and gases that moves downhill as a density current in the atmosphere. volcanic block - A pyroclastic rock fragment ranging from about fist- to car-sized. volcanic bomb - A pyroclastic rock fragment that shows the effects of cooling in flight in its streamlined or "bread-crust" surface. volcanic breccia - A pyroclastic rock in which all fragments are more than 2 millimeters in diameter. volcanic cone - The deposit of lava and pyroclastic materials that has settled close to the volcano's central vent. volcanic dome - A rounded accumulation around a volcanic vent of congealed lava too viscous to flow away quickly; hence usually rhyolite lava. volcanic dust - See volcanic ash. volcanic ejecta blanket - A collective term for all the pyroclastic rocks deposited around a volcano, especially by a volcanic explosion. volcanic emanations - Gases, especially steam, emitted from a vent or released from lava. volcanic pipe - The vertical chamber along which magma and gas ascend to the surface; also, a formation of igneous rock that cooled in a pipe and remains after the erosion of the volcano. volcanism - The process by which magma and associated gases rise to the Earth’s crust and are extruded, or expelled, onto the surface and into the atmosphere. volcano - Any opening through the crust that has allowed magma to reach the surface, including the deposits immediately surrounding this vent. V-shaped valley - A valley whose walls have a more-or-less uniform slope from top to bottom, usually formed by stream erosion. wadi - A steep-sided valley containing an intermittent stream in an arid region. warping - In tectonics, refers to the gentle, regional bending of the crust, which occurs in epeirogenic movements. water mass - A mass of water that fills part of an ocean or lake and is distinguished by its uniform physical and chemical properties, such as temperature and salinity. water table - A gently-curved surface below the ground at which the vadose zone ends and the phreatic zone begins; the level to which a well would fill with water. wave-cut terrace - A level surface formed by wave erosion of coastal bedrock to the bottom of the turbulent breaker zone. May appear above sea level if uplifted. wavelength - The distance between two successive peaks, or between troughs, of a cyclic propagating disturbance. wave steepness - The maximum height or amplitude of a wave divided by its wavelength. weathering - The physical, chemical, and biological processes by which rock is changed and broken down. xenolith - A piece of rock having a different origin from the igneous rock in which it is found. X-ray diffraction - In mineralogy, the process of identifying mineral structures by exposing crystals to X-rays and studying the resulting diffraction pattern. youth (geomorphology) - A stage in the geomorphic cycle in which a landscape has just been uplifted and is beginning to be dissected by canyons cut by young streams. zeolite - Microporous, aluminosilicate minerals commonly used as commercial adsorbents. Zeolites have the ability to selectively sort molecules due to a regular pore structure of molecular dimensions. zircon - Zirconium silicate (ZrSiO4). A primary crystallization product of igneous rocks that can survive geologic processes like erosion, transport and metamorphism. It is important for radiometric dating because it incorporates trace amounts of uranium and thorium. zoned crystal - A single crystal of one mineral that has a different chemical composition in its inner and outer parts. Formed from minerals belonging to a solid-solution series, and caused by the changing concentration of elements in a cooling magma that results from crystals settling out.